Fifty-two percent of Germans want Greece to leave the eurozone, up from 40 percent two weeks ago. Most appear alienated by Athens’ high-stakes bargaining, are skeptical if Greece will follow agreements, and are energized by an anti-Greek tabloid campaign. 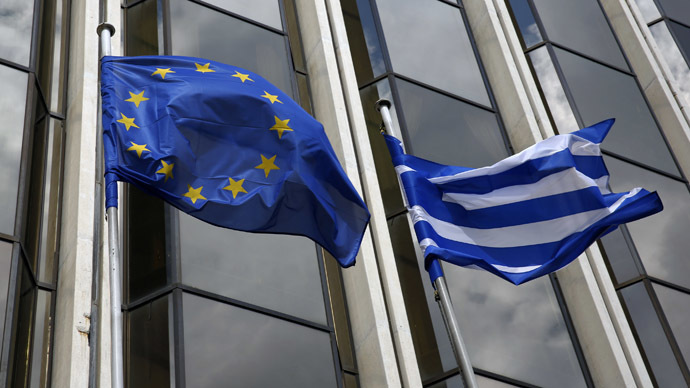 In the survey – conducted via telephone by the authoritative Politbarometer of the Mannheim Research Group between March 10-12 – only 40 percent of Germans said they wanted Greece to remain in the fold. Eight percent said they were unsure. Greece’s national debt stands at just under €445 billion (US$472 billion), including €240 million ($251 million) owed to the “troika” of international lenders, which restructured the country’s debt in 2012 in exchange for Athens' promise to implement key structural reforms. Only 14 percent of Germans now believe Greece is committed to those reforms, while 82 percent do not believe the ruling Syriza party will carry them out. The left-wing government of Alexis Tsipras, elected in January, has resorted to increasingly hostile tactics to combat what it says is an unmanageable burden. On Wednesday, Tsipras repeated an often voiced threat to demand reparations for Nazi war damages, threatening to nationalize German assets in the country. A day later, Greece's defense minister from the anti-immigration coalition partner ANEL said the country would “flood” Europe with “refugees, including jihadists” if it was not given financial aid by the rest of Europe. The phone survey showed that only 11 percent of Germans believe that Syriza is conducting its negotiations with the rest of Europe in a trustworthy fashion. The increasingly resentful national mood in Germany has been fueled by the Bild tabloid, which has been running a campaign with the slogan “NEIN” (“No”) – or rather, “No more concessions for the Greeks.” With a daily circulation of 2.6 million copies, Europe’s best-selling daily newspaper is influential not just with the masses, but also with the country’s ruling coalition. While Germany’s politicians previously shied away from discussing the possibility of Greece being forced to default and leave the eurozone, Finance Minister Wolfgang Schauble now says he won’t rule out such a scenario. “I think those in charge are obliged to tell the people the causes of the problems in Greece. They are not in Brussels, Europe or Germany. They are in the fact that Greece lived beyond its means for a long time,” he said in a pre-published interview for the Saturday edition of Austria’s Der Standard newspaper. So far, a vast majority of Greeks have supported the initial actions of Syriza since it stepped into power, with 88 percent of respondents telling a Marc survey for Greek newspaper Efimerida Ton Syntakton that they are in favor of the government’s policies. At the same time, it is less clear if the majority of Greeks want their country to now exit the eurozone, as some 69.6 percent of those asked said the government should look for an “honorable compromise” to resolve the crisis. Only 27.4 percent insisted on pushing Athens’ own terms, even if that meant leaving the eurozone. Meanwhile, with Athens and the EU at loggerheads, one in four leading economists interviewed by Reuters this week predicted that Greece would leave the eurozone. The reportedly changing German sentiment towards Greece comes amid a war of words between top officials of the two countries. Following reports that German Finance Minister Wolfgang Schaeuble called his Greek counterpart Yanis Varoufakis “foolishly naive,” Greece has submitted a formal protest to the German Foreign Ministry. In an interview to be published by Bild on Saturday, Greek Defense Minister Panos Kammenos has also accused Schaeuble of being ostensibly anti-Greek in his statements, Reuters reports. “I don’t understand why he turns against Greece every day in new statements. It’s like a psychological war and Schaeuble is poisoning the relationship between the two countries through that,” Kammenos was quoted as saying. The minister further accused Berlin of interfering into Athens’ domestic affairs – and even suggested that the German government wants Greece out of the EU. “I get the feeling that the German government is out to get us and some really want to push us out of the eurozone,” Kammenos said.